After the first two games of this season against Sunderland and Stoke City, when we did not score a single goal, I must admit I started to wonder where our goals were going to come from this season. I mean, we had sold the most prolific striker in the premiership during the summer and brought in three players with a lot of promise that on paper made us look a much better team than we were last term but after both games, it looked like it was going to be a while before the team will gel as a unit and start delivering on that promise. The manner with which our first two goals of the season were scored (by two of the new acquisitions) in our third game against Liverpool showed that there was no need to worry. That's not say that I'd have predicted a flurry of six goals in our very next game against a Southampton side that had been unlucky to lose against City and United. I'd predicted a win for us because Southampton is a team that's adventurous and likes to keep the ball down and play football unlike Stoke and Sunderland whose tactics against attacking sides like us is to sit deep and defend and hit back on the break with long balls over the midfield. This is usually the kind of game in which we excel because there aren't many football teams in the world that can keep the ball down like we do. In fact, only Barcelona can be said to be better at this than we are. Six goals later, after watching the kind of sublime football that has won Arsenal the hearts of lovers of the beautiful game the world over, it's clear to me that barring injury to key men like Cazorla, Arteta and Podolski, we are ready to mount a challenge for honours. A look at our bench yesterday showed the likes of Walcott, Giroud, Koscielny and Arshavin -this is a depth like we have not known for a while now. You can say what you want about some of these players but each is a full international not some fringe player and on their day they are potential match winners. When you put the likes of Wilshere, Sagna, Rosicky and the recently injured again Diaby in the equation, a clear picture of the depth of this squad should begin to emerge. We put down a marker quite early in the game when an attacking raid that saw Poldi overpower two Sunderland players in the middle of the park culminated in a through pass to Gibbs whose low driven shot at goal was parried unto a hapless Jos Hooiveld who turned it into his own net. In the 30th minute, Podolski bent in one beaut of a curler from a free kick 25 yards out, for his first goal at the Emirates. Whoa! When last did we see that? A goal scored directly from a dead ball situation and a master-piece at that. That free kick oozed of so much class you'd forgive anyone whose mouth still hung open a full three minutes after the ball hit the back of the net. It restored hope that we can once more become a threat from dead ball situations in the absence of the Dutchman who left for United. Even he seemed to have lost that magic in his last year as I can't remember right now if any of his many goals from last season came from a direct free kick. Poldi's own, I'm not going to forget in a hurry. Four minutes later, Arteta's clever through lob-pass sent Gervinho through on goal and he drilled the ball past the hapless Southampton keeper's near post to score his first goal of 2012. He scored his second in the 70th minute -a simple tap-in after Aaron Ramsey's shot bounced off the post and fell for him. What no one could have predicted was Arsene's decision to start him as a center forward in this fixture but he repaid that faith in his abilities excellently. The fourth goal came after excellent work by Gervinho when he laid a beautiful pass on to Gibbs whose attempted cross got turned into his own goal by Nathan Clyde as he attempted to block the ball from being delivered into the box. Only thirty-seven minutes gone and four goals up, it was evident that the boys were in the mood and no one had any doubts that more goals would come. Then came the downer as Sczezney's clanger ensured that the run of clean sheets ended. It was a high cross into the six yard box against the run of play, that he should have caught easily. There was no pressure on him from any Southampton attacker but he dropped the ball and David Fox didn't let the opportunity slip as he took the ball under control and drilled it into the gaping goal. A fourth clean sheet would have set a new record in the club's history as we've never kept four clean sheets in a row from the beginning of a season. "That's the negative of the day, that we conceded a goal, but we can swallow that. You have to concede at some stage but it happened like it happened". It was a downer but as my man Martin Gbados opined, "...whether you like it or not we won't go all season with a clean sheet so why dwell on it. The important thing was to have the goals come." I couldn't agree more. Now we can concentrate on winning up-coming games instead of worrying about setting records. 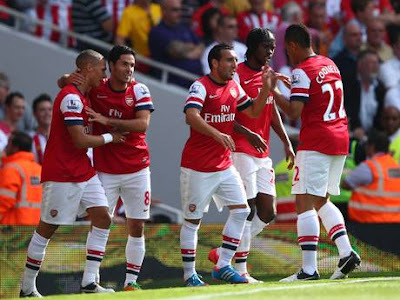 Theo Walcott came off the bench to complete the rout against his former club. Vermaleen's rare foray into the final third saw him drill another shot at the Southampton keeper, which he parried straight into Walcott's path and he kept his cool to fire the ball past the keeper. Unsurprisingly, his celebration was contained in respect for the club that gave him his professional break. Some of my predictions on Saturday morning about the make up of the starting eleven were wrong but then I'm not the manager and predictions are just that -predictions. Coquelin started ahead of Ramsey and Giroud was replaced by Gervinho in the starting line-up. Wenger said after the game that he started Giroud from the bench to relieve some of the pressure that's starting to build on the Frenchman and you really can't fault that line of reasoning. I'd expected that Kos will be taking over from Mert in the back four but Wenger had other ideas. Mert started and Kos was left on the bench and the big German turned out another excellent display alongside his center-back partner, Vermaleen. Evidently, Wenger is not going to be letting some players walk straight back into the team coming off an injury lay-off and rightly so. In the past, because of the dearth of quality in certain positions, certain players became the obvious first choice and only had to shake off an injury and they were smack back as if they never left. Kos will have to wait for his opportunity to get back into the team but of course this is the right kind of headache for a manager to deal with. "Cazorla is a player who is just a pleasure to watch. You want him to have the ball. He typifies what Spain's midfielders are today - he is technically perfect, he has great vision and a great team attitude..."
It's difficult to understand how we paid so little for a player of Cazorla's quality and abilities when you look at some of the price tags that have been put on players who aren't worthy to tie the little man's boots. The most obvious reason is that some smart wheeler-dealer pulled off the coup of the season but something tells me that this was made possible mostly because Cazorla looked at Arsene Wenger's football philosophy and saw shared ideals. He's well on his way to becoming a cult figure at the Emirates and he hasn't laced his boots five times for the club yet. It will be nice to continue to single out players for praise now but Saturday's game was such an excellent team display that it will be unfair to go this route. It was a magnificent display from the team as a whole unit. One we'll be hoping to build on on Tuesday evening as the Champions League begins away at Montpellier. We can definitely expect some squad rotation as the manager attempts to keep the squad fresh. With Chelsea and City dropping points, we made our way into the top three on the table so I'd say it was a good weekend. Some will say it's a tad too early for table watching but it's important to keep pace with other contenders from the beginning. Last season saw us in the lower half of the table at this same point of the season and whatever revival we mounted afterwards had us playing a catch-up that never ever looked likely to see us emerge at the top. It's a new week and may it be as good for you as the weekend was for the Gooners. leave Cazorla for a minute, Podolski may be the real coup of the summer. his work rate is way above any one else and he seems worthy of the no 9 shirt he wears. I am happy that the team poured in goals...when Giroud was brought in the instruction should have been to keep feeding him the ball...Theo denied Giroud his first goal...now heading into the 2 weeks that will define our season it is important that everyone comes to earn their wages...the reserves, the bench and which ever firts11 that plays any of the 4 crucial games..rotation and depth will come into play...I believe that the most difficult of all this games will be coventry...knowing that we might be relaxed and that will not be good....City game is a most win not a draw but a most win...this will do our team a lot of good and send message across the EPL..that's the day I will like to see if the defense is for real...the squad we have now will beat Chelsea anyway....tomorrow is the start of the two weeks and hopeful familiar grounds will bring fortunes to Giroud... Let's go Gonners!